Whether you are dreaming of a stone patio to be used as an entertainment area for friends and family, a tranquil area to display beautiful potted plants and relax, or any other reason, the experts at Ambrose Landscaping can help turn your dream into reality. A natural stonework patio is a major feature of your outdoor living space, and it should be designed and installed to your specifications. Ambrose has the experience and know-how to build the natural stone patio that you’ve envisioned. If you are in the Asheville or Western North Carolina area, Ambrose Landscapes is the local stonework expert you need to create your ideal stone patio. Home residence stone steps, patio, and retaining wall with proper drainage. 2-level stone patio for hot tub. Why Choose Natural Stone for Your Backyard Patio? When you decide to add a patio to your backyard, you obviously have several choices as to the materials and design of the project. Unlike other backyard features that are moveable or changeable, a patio is isn’t easy to change once it’s installed. That means it’s quite a commitment and that you should consider all your options before you have a patio installed. You may have considered a deck or concrete patios as alternatives to natural stone. Here’s how they stack up. A deck is one option that enhances outdoor living spaces. There are several options available with decks – size, material, how far off the ground it is – that you can choose from. Decks are typically constructed out of wood, a composite that looks like wood, plastic, or aluminum. The problem with these materials is that they don’t have the durability, long lifespan, or natural beauty that stone patios do. While decking may seem like a viable competitor of natural stone, if you do a little bit of research and shopping around, you will find that natural stone is the best option for a patio. Concrete is often used for patios because it’s relatively inexpensive. However, whether it is poured concrete or concrete pavers, there are some drawbacks that you may encounter. Poured concrete is known to be prone to cracking over time, and that’s difficult (and costly) to repair. While concrete pavers can easily be replaced should one crack or break, they are costly to manufacture and never look natural. What Other Types of Backyard Features Can Be Constructed from Natural Stone? If you fall in love with natural stone, which we suspect you will, you don’t have to stop at a beautiful new natural stone patio. There are many other types of structures that can be designed and installed using natural stone. You may consider adding a fire pit to your patio or backyard to keep guests warm on cool evenings, or for roasting marshmallows, or even grilling a meal. Just like other natural stone designs and structures, a stone fire pit provides function and form to any backyard setting. You might also consider having a natural stone bar installed for entertaining purposes. Not only will it provide you and your guests with convenience and functionality, it will also complement your patio, adding another layer of natural beauty and upscale charm to your outdoor living space. How Much Does the Installation of a Natural Stone Patio Cost? A natural stone patio is a beautiful addition to any home or yard. Using stone creates an attractive, durable, and distinctive look and feel to your patio. It can function as a deck, outdoor living space, entertainment area, or even include a walkway to other areas of your yard. While you will find that patios built with other types of materials (bricks, concrete, etc.) may be less expensive than those constructed with natural stone, you will also find that natural stone provides you with a longer lifespan, increased durability, less maintenance, and remarkable, one-of-a-kind natural beauty. There are several factors that affect the cost of stone patios. The type of stone you chose to have installed, the complexity of the project, and the type and location of the ground where your patio will be, are all aspects that can impact the overall cost of the patio. The investment you make on your stone patio may be more than if you chose other materials, but it will more than make up for the extra cost sooner than you might think. 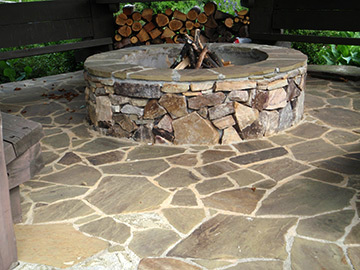 Why Choose Ambrose Landscapes for a Stone Patio in Asheville? When you work with Ambrose Landscapes for your stone patio or other backyard designs, you can rest assured that you will enjoy professional and beautiful results. Our team has decades of experience in the design and installation of stonework patios, fireplaces, walls, signs, and many other outdoor features. We can help you with the design of the perfect structure, one that prevents soil erosion and provides stormwater management, if that’s what you desire. Wherever you live, we can create the natural stone patio in Asheville you are looking for – one with the durability to last a lifetime and the natural beauty that never goes out of style.